How big are the walruses tusks really? The tusks are actually large canine teeth and can grow to be as long as three feet! Is it hard to find ice with chlorophyll and to bring it back to the lab? It’s not too difficult. We use a drill attached to a core barrel. 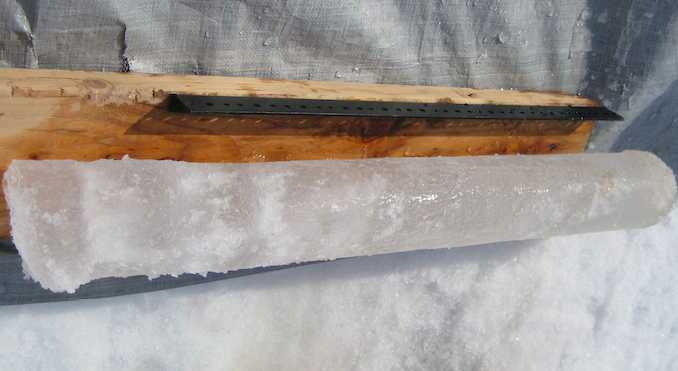 We drill into the ice (just like drilling a hole in a piece of wood). Since the core barrel is hollow, the ice core stays inside while we pull it up and out. It is put on a surface with a yard stick and sawed into smaller pieces. The pieces are put into plastic bags and brought back to the ship. It is then melted down to water, filtered and tested for chlorophyll. Water samples are also taken to test for chlorophyll. The water samples are taken with a CTD. Please see the post, “Scientific Equipment” to see all the great equipment used to collect samples! Have you seen any snowy owls? No, we haven’t seen any owls. Our entire expedition has been on the ice. Snowy owls do live in Alaska but not on the ice. We left from Dutch Harbor, AK which is in the Aleutian Islands. The snowy owl lives in the interior, south-central and south-west areas of the state. Do you drink lots of hot chocolate when you feel cold? Hot chocolate is always available and a lot of people like to drink it when we come in from the ice. Arctic Melt Pond Water- Delicious!